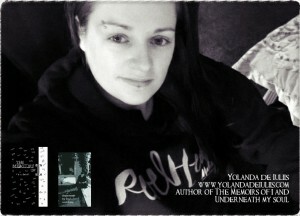 Tention Free : Hi, Yolanda! What is The Memoirs of ‘I’ about ? 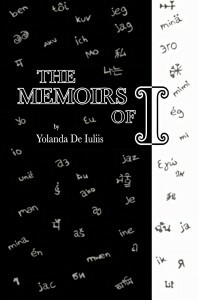 The Memoirs of ‘I’ is a philosophical , thoughtful and soulful book in which I reflect on a daily basis over a one year period of my life. It takes the reader through many ideas, dreams, questions and different concerns with life and this planet in which we all share. Tention Free : When did you first realize you wanted to start a Memoir ? Tention Free : Tell us about the cover and how this idea came about? 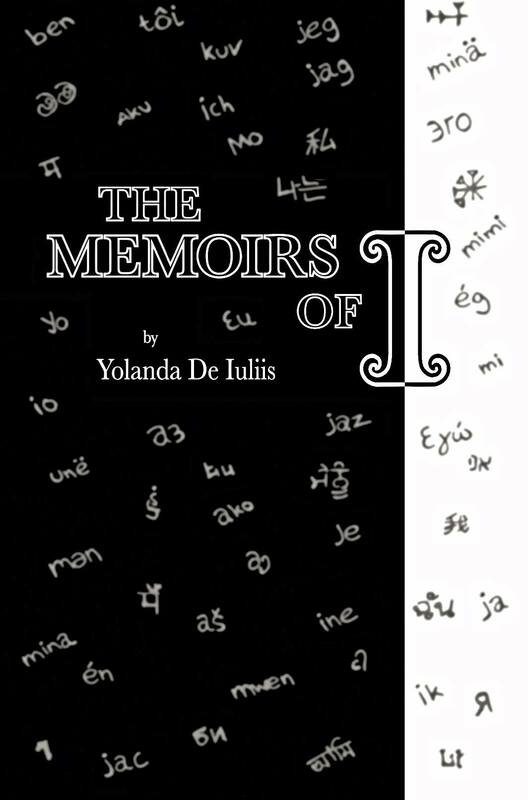 The front cover of The Memoirs of ‘I’ was drawn by myself and I wanted the reader to become the ‘I’ therefore I researched many different languages to translate the ‘I’ and ‘ego’ so I could put it on the front cover to gain attraction and significance for many nationalities. Tention Free : Has your memoir helped you to evolve creatively ? Yes, in a great way ! I really started to research many different books, papers, ideas, theories and thoughts which in turn developed the way I write and I become not as scared to be as creative with my words and ideas. Tention Free : Is there a message in your memoir that you want readers to process? There are many messages I would like the readers to process whilst reading my memoir but it depends on the reader as it will have a different effect on each individual but the main purpose is for each reader to gain some inspiration and to see life and this world that we all share that bit more special and differently. Tention Free : What was the hardest thing about writing The Memoirs of ‘I’ ? I think the hardest part of writing The Memoirs of ‘I’ was reflecting and thinking everyday on issues we tend to ignore about ourselves and the world. It did at times make me sad although it helped me to then try and see the positives and express this to the readers. Tention Free : What did you learn whilst writing The Memoirs of ‘I’ ? I learned how beautiful yet how horrible oneself can be and how negative and positive clearly surrounds all of us but we don’t realize it very much. I had to reflect on my past, mu own pains and my own crazy thoughts and this was a hard challenge but made me a better person for it. Tention Free : Who will enjoy reading The Memoirs of ‘I’ ? I would say anyone who wishes to see a thinkers perspective on life and this Earth in which we call home. Anyone who enjoys philosophical thoughts, asks questions or wants to find some inspiration. Tention Free : “What are your thoughts on writing a book series? I have not thought much about this idea but I could do another memoir at some point of my life if I feel it is appropriate. Tention Free : What inspires you to write ?